Yes black is safe but no one said it had to be boring. 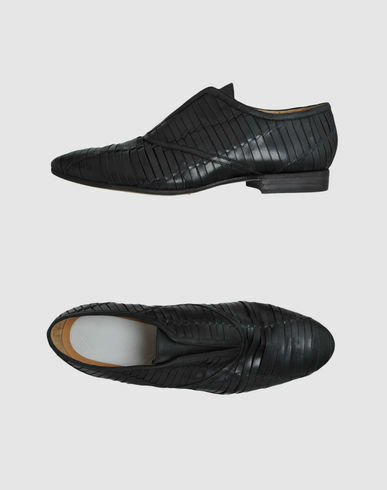 Margiela shakes up its take on a classic slip on silhouette with this black moccasin for Spring 2012. Perfectly acceptably without socks and work with slim jacquard knit shorts or with semi-sheer socks and worn with cuffed tonal slim seersucker trousers. How wonderfully convenient to not have to worry about a shoe change from day to night yet still have the shoe be an interesting and cool versatile option. Available now at Yoox.com.